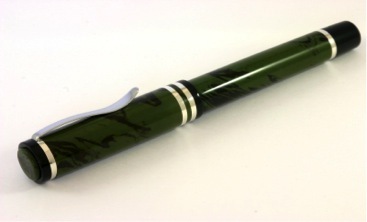 An Interview with John Twiss of Twiss Pens – Pens! Paper! Pencils! Before reading this very interesting interview, take some time to look through John’s site and see what wonderful work he does. Also, check back here at my humble little site for something very very special coming soon. The first question has to be the obvious one: why did you choose to make pens rather than anything else? I took early retirement about 5 years ago. After a couple of years during which time there was a separation and a move up to Nottinghamshire, I felt I needed a hobby to help fill some time. I love cars and have built a couple of kit cars and owned a few classics, but that hobby was well out of my price range. I remembered at school I made a couple of bowls on the wood lathe and really enjoyed it, so I hit fleabay and bought an ancient lathe for £50 and some firewood! After a week and producing some smaller bits of firewood, albeit round firewood, I was bored again. Whilst browsing youtube I saw a video of someone making a pen, and having always had a fascination for pens decided to give it a go. Well, that was it, hook line sinker and rod! That was 3 years ago next month. Initially it was kit pens, mainly biro’s. Most of these were given to friends and family who raved about them. Of course, after running out of people to give them to as presents I had to do something else with them. I needed a part time job to supplement the pension, but there was nothing around so I thought I would try selling my pens at a craft fair. This was quite successful. I did a craft fair at Sherwood Forest Art and Craft Centre in the summer of 2012, and was really impressed with the place and kept badgering the council until a studio became available. I moved into my studio just before Christmas that year. Now I could make pens and sell at the same time. It was also good to have a proper base to operate from. Not long into making pens from kits I knew I wanted to design my own and make them from scratch. There is such a challenge making these types of pens which I think is part of what gives so much pleasure. The kit pens pay all the bills, and there is no way I can charge an hourly rate for the custom ones as they would never sell! What is your most commonly used pen? It’s one of my biro’s that isn’t good enough to sell fitted with a stylus tip on the cap. What makes a good pen? A very difficult one to answer as it is different for everyone. I think a pen is a very personal thing. In my case it should be a fountain pen. It should flow nicely with no skipping. It should be very comfortable to hold. Preferably something that stands out from all the rest! What’s the most unusual pen you’ve ever made? 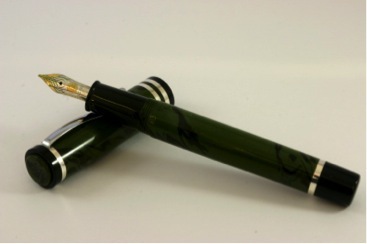 I had a request last year to make a pen by casting someone’s departed brother’s ashes in resin! I declined this commission… the first one! I suppose you could call the one below unusual. This is part of a commissioned series of pens. This particular one is a tribute pen to Galileo. I’m currently modifying it slightly to make the body a bit longer, The lenses are clear resin that I have turned and shaped. The Celtic bands are a sandwich of wood veneer between two pieces of aluminium from coke cans and inlaid into the wood before turning. The section is made from brass with the barrel being Ebonite. This is probably my favourite. Made using Ebonite with Stirling silver bands that I make from sheet metal. 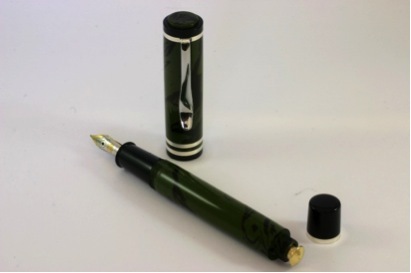 It is a button filler fitted with a Pelikan nib unit. What would be your dream pen? And why haven’t you made it yet? I have quite a few dreams/ideas!!! One of them is to create my own solid silver parts to make pens. This is one of those things that may never happen as it needs quite a bit of time invested in it. It would basically be making my own kit pen but using Sterling silver for the metal parts. The main difference between what I plan and a kit would be that there would be no brass tubes in the barrel and cap, and the silver would be quite thin where possible to keep the weight down primarily but also the cost. I would make the parts in brass then have them cast in silver. I am currently in discussions with a silver smith about producing silver overlays for a range of custom pens. Thank you so much John for a fascinating interview! 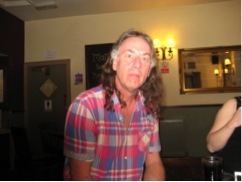 Take a look at John’s site to see what amazing work he does and then perhaps place an order! Also, check back here soon for something very special.